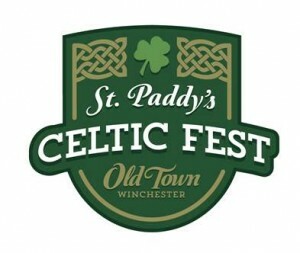 Celebrate the community’s Irish and Scottish heritage at the annual Old Town St. Paddy’s Celtic Festival on Saturday, March 9th from noon to 9:00 pm. This festival is free and activities will take place inside Old Town businesses and along the Loudoun Street Mall (weather permitting). Continued this year! 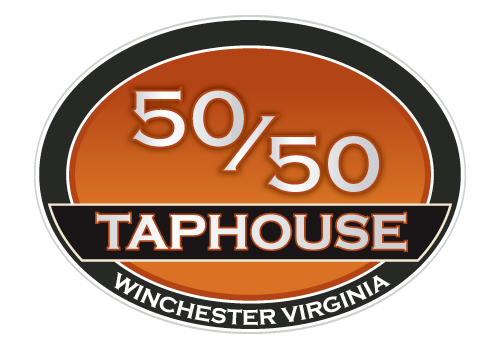 During all scheduled performances, a percentage of food and drink sales will benefit SPCA of Winchester, Frederick, and Clarke Counties. SPCA will host Celtic games for children on the Old Courthouse lawn. The Celtic games will provide fun in a non-competitive atmosphere for lads and lassies ages 3-12. 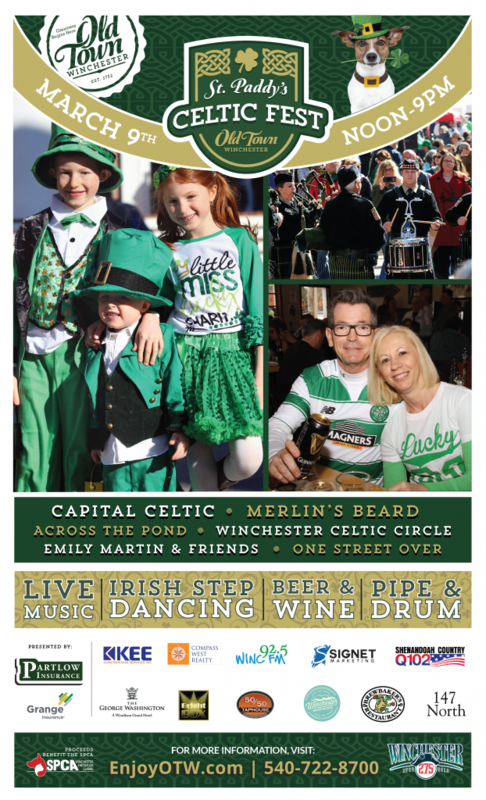 A balloon artist, face painter, dancers, vendors, and bagpipers will be on the Loudoun Street Mall and in Old Town shops and restaurants throughout the day. Enjoy fresh Kettle Corn and have your photo taken Celtic style, in a free photo booth. There will also be alpacas on the Old Courthouse Lawn! 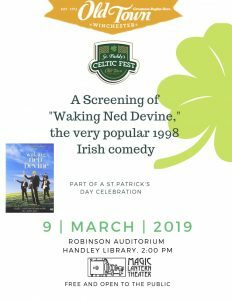 Back by popular demand this year, the Magic Lantern Theater and Handley Library will co-sponsor a 2pm showing of the movie “Waking Ned Devine”. A sly Irish comedy about a lottery winner dying of shock in a small Ireland town and his fellow townsfolk attempting to claim the money. The Black Rose – 11 S. Loudoun St.
Iced Matcha Green Tea; Iced Powerhouse Green Grass Tea; Avocado Smash sandwich served with a side. Spend over $75 and receive a FREE canvas shopping bag with Black Rose logo. Open 11-7. Bluebells – 6 W. Boscawen St. Tea and cookies from noon-4pm, plus 20% off all candle purchases on event day. Espresso Bar & Café – 165 N. Loudoun St.
Eugene B Smith Gallery – 25 N. Loudoun St.
17% discount on prints & framed prints Saturday, March 9 through Sunday, March 17. Special discounts for whoever finds the lucky green or gold shamrocks in the gallery March 9-March 17. Himalayan Tea tasting. 20% off winter items. Fellowship of the Sip Restaurant and Tea House – 33 S. Loudoun St. Deep, dark, strong Irish tea and very green teas; Irish coffee and Irish coffee cake; Irish music; beer; cakes and cookies; Leprechaun’s Gold drawing. The George Washington Hotel – 103 E. Piccadilly St.
Special Celtic Fest menu offered in both the Half Note Lounge and George’s Food & Spirits. 20% off anything green and 15% off anything else. Kindred Pointe – 151 N. Loudoun St.
Knitters Magic – 212 S. Loudoun St.
10% off purchase of any green yarn (yarn by bbknits not included). Love’s Affect Jewelry – 3 S. Loudoun St.
20% in store and some festive treats! Macado’s – 121 N. Loudoun St.
Corned beef and cabbage platters with au gratin potatoes; a twist on shepherd’s pie; Irish inspired beverages. Murphy Beverage Company – 167 N. Loudoun St.
Come meet the “Green Man” starting at noon. Old Town Snow White Grill – 159 N. Loudoun St.
A scoop of vanilla ice cream with chocolate syrup and green sprinkles. Once Upon a Find Gift Shop – 48 S. Loudoun St.
Stop and get your $5 Clover Bucks, good towards any $25 purchase. Complimentary coffee and cookie with purchase. The Polka Dot Pot – 157 N. Loudoun St.
Bring this flyer in for 17% off your purchase, good through 3/17/19. Posh Pets Boutique – 156 N. Loudoun St.
17% off all St. Patrick’s Day pet accessories, dog treats, and green clothing. Red Fox Creamery – 146 N. Loudoun St.
Silver Cloud Jewelry – 142 N. Loudoun St. Giant silver jewelry and clothing 20-30% off storewide. Shenandoah Valley Discovery Museum – 19 W. Cork St.
Family-friendly Shamrock and Leprechaun-themed activities. Thinker Toys – 106 S. Loudoun St.
20% off Green Toys. Green Toys is a brand of toys for young children made entirely in the USA from recycled milk jugs. Union Jack Pub & Restaurant – 101 N. Loudoun St. Featuring Riley Kerns from Reckless Island starting @4pm. UJP’s Head Chef featuring traditional Irish inspired menu including Dublin Coddle, Irish Stew & Chicken & Leek Pie! Available on tap: Guinness, Smithwicks, Oharah’s, Magners Irish Cider. Wilkins’ ShoeCenter – 7 S. Loudoun St. Wear green and receive 10% off your purchase (exclusions apply). Winchester Book Gallery – 7 N. Loudoun St.
Children’s Book Signings. 11am – 1pm, author Linda Johnson – Little Turtle Island & Yellow Bird. 2 – 4pm, author Dawn McCarty – Being Different Rocks! For more information about the event contact the Special Event Coordinator at Full Circle Marketing, Dario Savarese, at Dario@fullcirclem.com or 540-722-8700. Visit www.EnjoyOTW.com for further information on these and other happenings in Old Town Winchester, VA. Great memories begin here!